MANIT Bhopal PhD Admissions 2018 - Maulana Azad National Institute of Technology (MANIT) invites application for admission to Full Time Doctor of Philosophy (PhD) Program for the academic year 2018-19. Interested candidates can check all the details of MANIT Bhopal PhD (Even Semester) Admission 2018-19 like application form, eligibility criteria, application procedure etc. from this page give below. 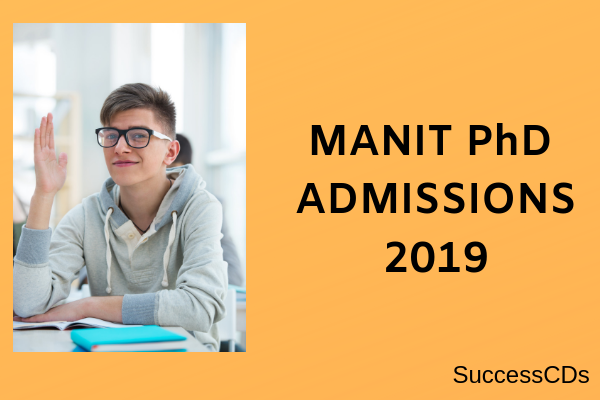 Complete notification for PhD Admission at MANIT Bhopal out! Check the details below. i. Full Time Research Students. iii. Project Staff (In all Department/Centers) (as per ordinance 10.1.1(3)) JRF working in the Institute under Externally Funded Projects from agencies such as CSIR, UGC, DST, DAE, DRDO etc. Full Time PhD Program in the following departments of the Institute: Civil Engineering; Computer Science & Engineering; Electrical Engineering; Electronics & Communications Engineering; Mechanical Engineering; Chemical Engineering; Materials & Metallurgical Eng. ; Energy Centre; Biological Science & Eng. ; Architecture & Planning; Physics (Physics, Nanoscience & Eng. Under Dept. of Physics); Chemistry; Mathematics (Mathematics, Computer Applications & Bioinformatics under Department of Mathematics); Humanities and Social Science and Management Studies. Reservations are as per prevailing GOI norms. For reserved category students i.e. SC/ST/PwD a relaxation of 5% (0.5 in CGPA) is applicable. Architecture & Planning: Master degree in Architecture / Planning with minimum of 75% or CGPA 7.5 and GATE qualified. Humanities & Social Sciences: Master degree in Humanities / Social Sciences with minimum of 75% or CGPA 7.5 and NET qualified. The application form can be downloaded from the Institute website www.manit.ac.in. Duly completed application form in the prescribed format will only be considered. The payment of processing fee is to be done only through SBI online “SBI Collect” into the account of the Director, MANIT, Bhopal. The envelope must contain the following header, “Application form for Ph.D. Admission in ……………………… Department”. Applicant must submit separate application form along with separate processing fees, if he/she wishes to apply in different departments. Candidates are advised to visit the institute website regularly for further updates. Section 1: English (50 Marks, 30 Minutes, 25 Questions). Section 2: Mathematical Ability (50 Marks 30 Minutes, 25 Questions). Section 1 and 2 of written test of 1 hour is common for all the departments, Section 3 written test of 1 hour will be conducted separately for each department. Section 3: Concerned Subject (100 Marks, 60 Minutes, 50 Questions). Copies of Section 3 will only be evaluated when student will attain minimum total 40 marks in Section 1 and Section 2. Branch wise Merit list will be prepared on the basis of total marks of Section 3 only. A relaxation of 5% in minimum normalized cut off in the written test will be given to SC/ST/PwD Candidates.